The Filigree Bronze Cremation Urn is cast in solid bronze. 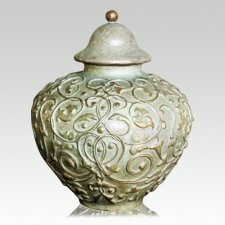 This urn features a stunning filigree design that covers the body of the urn, with an antique white and patina finish. This elegant urn is created through the ancient form of 'lost wax' method, to produce a vessel that is nothing short of a masterpiece. Create an unforgettable tribute to the garden lover with this unique urn.